Libertarian nominee Gary Johnson is on the ballot in every state except Rhode Island. Efforts remain underway to get on the ballot there. Green Party nominee Jill Stein is on the ballot in 42 states. The campaign is awaiting results of their filings in Rhode Island and Wyoming. Write-in votes for Stein will be allowed in Georgia, Indiana and North Carolina. No ballot access in Nevada, Oklahoma and South Dakota. Both nominees are on the ballot in the District of Columbia. To track how Johnson and Stein are doing in the public opinion polls, visit our polls page and check the box to display polls with 3rd party nominees. You can also link to all polls for a given state. We're not following this campaign as closely, but independent Evan McMullin is on the ballot in nine states, including Arkansas, Colorado, Idaho, Iowa, Louisiana, Minnesota, South Carolina, Utah and Virginia. The Washington Post, in conjunction with SurveyMonkey, has conducted a poll* in each of the 50 states. Per the Post, "Donald Trump is within striking distance in the Upper Midwest, but Hillary Clinton’s strength in many battlegrounds and some traditional Republican strongholds gives her a big electoral college advantage". For purposes of the map, states with margins of 5 points or less are considered toss-ups, while those with margins greater than 10 points are considered 'safe'. 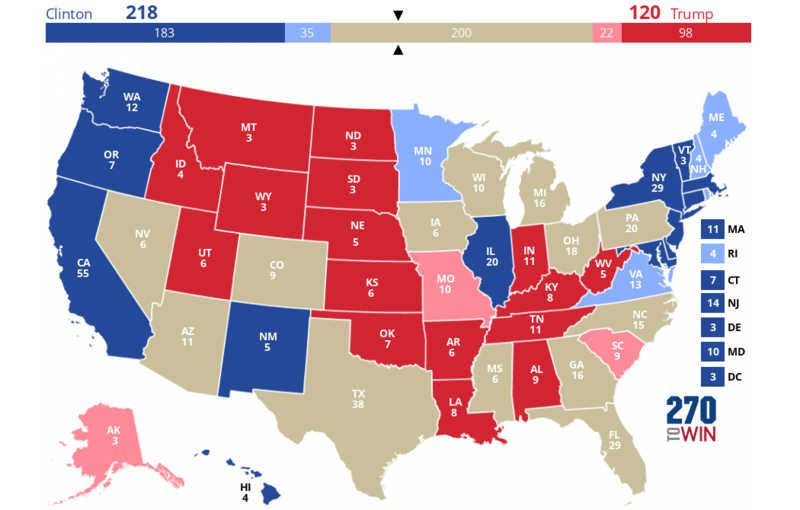 The lighter red/blue are 'lean' states, in-between those two ranges. In the electoral map based on polls, Clinton currently leads 262-145 with 131 electoral votes as toss-up. 84 of Clinton's electoral votes, and 42 of Trump's are in the 'lean' area. 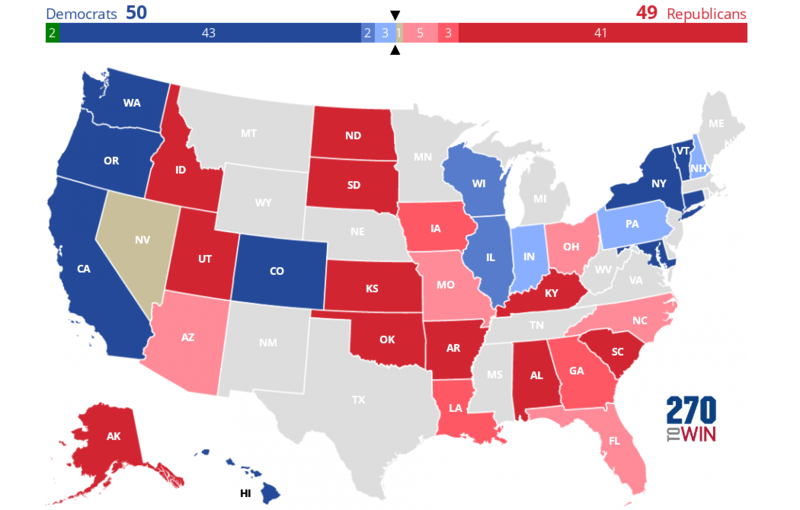 Most of the larger 'lean' states end up as toss-up in the Washington Post-SurveyMonkey poll. Of particular note is Texas, where Clinton led by one. On the other hand, Pennsylvania and Michigan, which together comprise about as many electoral votes as Texas, were much closer in this poll than in the polling average; these states have been leaning toward Clinton. Other significant differences vs. traditional polls include Colorado and Mississippi (much closer) and Missouri (larger Trump lead). The above analysis is all based on Clinton vs. Trump head-to-head. The poll also looked at a four-way race in each state. Both Gary Johnson and Jill Stein greatly outperformed traditional polling, with Johnson at 10% or higher in more than 40 states, including 25% in New Mexico (just 4% less than Trump). If this set of surveys is correct, the third party nominees have significant support not registering in traditional polling. This would be a very significant finding, although we have no way of knowing which view of the world is correct at this point. * SurveyMonkey conducts polls using online-based sampling. These are surveys taken from a pool of recruited respondents, a subset of the population that takes surveys on the SurveyMonkey platform. This differs from traditional polling where respondents are selected at random, meaning (in theory) that any member of the population being sampled (e.g., likely voters) could be selected. In traditional polling, a margin of error, to reflect how far the sample population might deviate from the full population (based on probability theory) is calculated. In the SurveyMonkey polls, only those who have opted-in to the platform can be selected, thus no margin of error associatd with the full population can be calculated. However, in these "non-probability samples, testing is necessary to ensure a particular sampling strategy, along with adjustments to match population demographics, can consistently produce accurate estimates." Public Policy has surveyed the presidential and Senate races in seven battleground states. Nothing dramatically out of line with the existing averages for these races was found. Visit our Recent 2016 Election Polls page to link to the individual details. All seven states came surveyed were somewhat to highly competitive, with the largest margins a Clinton lead of 7 in Wisconsin and a Trump lead of 6 in Missouri. Other than New Hampshire, where Clinton's average lead is 10.5%, none of these results were more than 2-3 points from the polling average in each state. This set of polls yielded no change to the electoral map based on polls, where Clinton leads 262-145, with 131 states polling within 5 points or less. Senate races were a bit more spread out, ranging from a Republican lead of 9 in Ohio to a Democratic lead of 7 in Wisconsin. Arizona was exactly tied. The Ohio number also stands out when comparing to the presidential race there. Donald Trump is running 13 points behind the Republican incumbent Senator, a much greater spread than in any of the other states surveyed. The tightness of the race in Arizona is the largest deviation from polling average, where McCain leads by 6.5%. Hillary Clinton leads Donald Trump by 7 points among likely voters, a new Monmouth University national poll finds. How you interpret this might depend on your perspective: The lead is down sharply from the 13 point advantage Clinton held in the last Monmouth poll, 3 weeks ago. However, a 7 point lead is slightly above the national average, which now shows Clinton ahead by 6 points (5.4% when 3rd parties are included). A new series of 'rust belt' polls by Emerson College shows Hillary Clinton with a small lead over Donald Trump in Michigan and Pennsylvania, while Ohio was tied. All of these results showed a closer race than the averages for these individual states. Ohio: The race is between Clinton and Trump is tied at 43%, with Gary Johnson at 10%, Jill Stein at 2%. Several polls in late July also found the race tied, although several subsequent polls had Clinton ahead by several points. With this poll, Clinton's head-head average lead is now 3.8%. No Republican has ever won the White House without winning Ohio. In the Ohio Senate race, Rob Portman registered a 15 point lead over challenger Ted Strickland, 40-25%. That seems like a pretty large number of undecideds for two well-known nominees. Pennsylvania: Emerson finds a three point Clinton lead here, 46% to 43%. Gary Johnson received 7% support, Jill Stein 2%. Clinton has led every poll here since mid July, several of them by double-digits. Her average lead remains wide at 9.4%. While Pennsylvania seems to be in play each election cycle, it last voted for a Republican in 1988. In the Pennsylvania Senate race, Pat Toomey led by 9 points over challenger Katie McGinty. This result is also quite different than other recent polls, all of which had McGinty at least slightly ahead. Finally, in Michigan, Clinton leads by five over Trump, 45% to 40%, with Johnson at 7%, Stein at 3%. This five point spread is more in line with other recent polls, although, as in the other two states, it shows a closer race than the average. With this result, Clinton now holds an average 7.6% lead over Trump. As in Pennsylvania, Michigan last went red in 1988. There is no Senate race in Michigan this year. Emerson shows a closer presidential race in all three states than other recent polls. Whether that reflects a shift back toward a tighter race or is just an outlier based on pollster methodology remains to be seen. While it wouldn't surprise us to see some tightening of the race after several rough weeks for Trump, it is notable how much stronger the Republican incumbents also did in the two Senate races than in recent polls. This might hint that the reversal in the presidential race may not be quite as sharp as this set of polls indicates. It is why it is always best to look at an average of polls. This will become easier after Labor Day as the state-level polling becomes much more frequent. Politico reports that Chris Suprun, one of Texas' 38 Republican electors, has indicated that if Donald Trump wins his state, as seems likely, he may cast his electoral college vote elsewhere. Earlier in August, Baoky Vu, then a Georgia elector, indicated the same, while going even further by saying he wouldn't vote for Trump in November. Shortly after those comments, Vu resigned. About half the states bind electors legally, the remainder do not. Texas and Georgia are two of the states that do not require electors to vote in line with the popular vote results. Electors not voting as pledged are known as 'faithless electors'. These are rare, particularly in modern times, as the electoral slates are usually comprised of those very loyal to the party they represent. Wikipedia has a list of faithless electors. When a voter goes to the polls on November 8th, his or her vote for a presidential candidate is actually a vote cast for a slate of electors selected to represent that candidate/party in the electoral college. There is a separate set of electors for each party on the ballot. Independent and write-in candidates may or may not have a slate, it seems to vary by state. The number of electors in each slate are equal to the state's electoral votes. Electors are listed on a on a Certificate of Ascertainment, which each state is required to file after the election. Here's the Texas one from 2012. The electors associated with the winning candidate in each state will meet to vote on December 19th, where each will individually cast his or her electoral college vote. The votes are recorded on a Certificate of Vote, a copy of which is sent to the President of the Senate (VP Joe Biden) for the official count on January 6, 2017. Here's Texas' Certificate of Vote from 2012. If Mr. Suprun, or another elector, were to cast their vote differently than as pledged, it would occur at this December 19th meeting. For third party candidates, ballot access is crucial if polling support is to translate into votes on Election Day. As of now, Libertarian nominee Gary Johnson is on the ballot in 43 states + DC, with efforts underway to get access in the remaining seven states. Green Party nominee Jill Stein is on the ballot in 35 states + DC. Johnson's ballot access represents 487 of 538 electoral votes, while Stein is at 425. Although clearly less desirable, it is worth noting that some states allow limited access via write-in for names not printed on the ballot. Both Johnson and Stein are repeat nominees for their parties. In 2012, Johnson was on the ballot in all but Michigan and Oklahoma. Stein was on the ballot in 36 states + DC. The Clinton campaign is opening a field office in Salt Lake City, the USA Today reports. Although no Democrat has won the state since 1964 and Mitt Romney won by almost 50 points in 2012, the campaign sees an opportunity in the high unfavorable ratings for Donald Trump.